As the official buyback partner for Cult of Mac and other tech blogs, we at MyPhones Unlimited go through hundreds of used phones a day. But this is the first time we’ve come across this type of device. We give all incoming phones a basic function test — and this device passed without a problem. It’s so convincing, it passed through a few hands without notice. If it had been only a little better, the owner might have walked away with a $340 check from us. You’ll see subtle differences between the real iPhone settings on the left and the fake iPhone menu on the right. While this iPhone clone might impress with its good lucks, the tech inside is far from remarkable. In fact, it’s terrible. Nonetheless, HDCplayer Technology‘s ability to develop its own parts and pack them into a near-perfect iPhone replica proves fascinating. 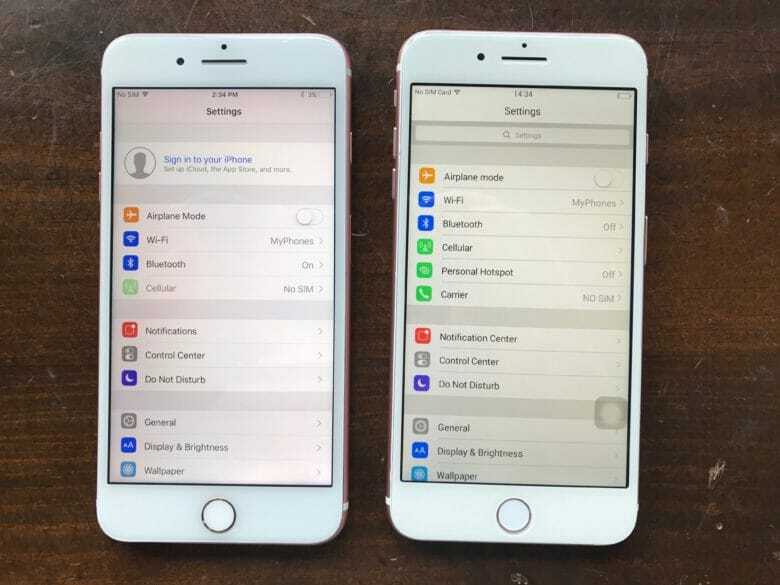 The operating system, which is this iPhone clone’s biggest flaw, is a version of Android roughly hacked into a copy of iOS. It possesses all the fluidity of a baby learning to walk. This is surely due to the bootlegged Android operating system disguised as iOS. The fake iPhone goes through the motions, but fails on most functions. For example, it offers the option to set up Touch ID, and even seems to scan for fingerprints to set up a fingerprint lock. But, alas, a fingerprint won’t unlock the phone. The devil really is in the details here. From the just-off typeface of the “iPhone” label on the back of the phone to the shoddy operating system, the subtle differences quickly add up. Some apps, like Maps, connect directly to the Android equivalent rather than the proper iOS app. Others, like iBooks, look like poorly built Android apps. Still, somebody seems to have put a lot of effort into a few of the look-alike apps, including Apple Watch and Find My iPhone. They benefit from higher-quality graphics and clear attention to detail — but they don’t work at all. We also checked the phone’s IMEI number, a unique 15-digit identifier that reveals information about a device. Interestingly, instead of making up a random number, this IMEI number showed up as a 16GB gold iPhone 5s. Since no one in the MyPhones Unlimited office was willing to give up their own Apple ID for research, we aren’t positive what happens if you enter your information into the apps. The best-case scenario is they simply won’t work; the worst-case scenario is that some Chinese corporation can peek at all your secrets. We contacted a representative of HDCplayer Technology but didn’t get much more than a price list. Apparently, it’s a factory in China that sells “many, many” phones. The company didn’t respond to further questions. 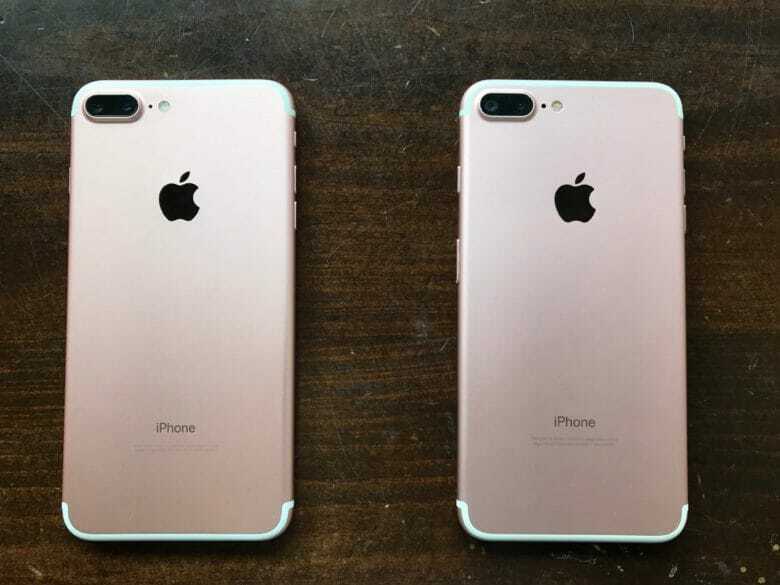 The iPhone 7 Plus clones the company sells range in price from $85 (for a dual-core phone with 512MB off RAM and 8GB memory) to $170 (octa-core with 2GB RAM, 16GB memory, 4G connectivity and a real fingerprint scanner). Plus, you can upgrade to 64GB of memory for $20 or 128GB for $40. Why is this significant? For starters, take this as a warning to double-check the legitimacy of a phone the next time you buy a used one. It doesn’t take long to realize you’re working with a fake. Just be sure to give it more than a glance when you’re in the McDonald’s parking lot meeting a stranger from Craigslist. Few people are unknowingly walking around with fake iPhones, but better safe than sorry. The bigger story here is that manufacturers are getting close to making iPhone copies that could pass as real. The progress they’ve made can’t be overstated. 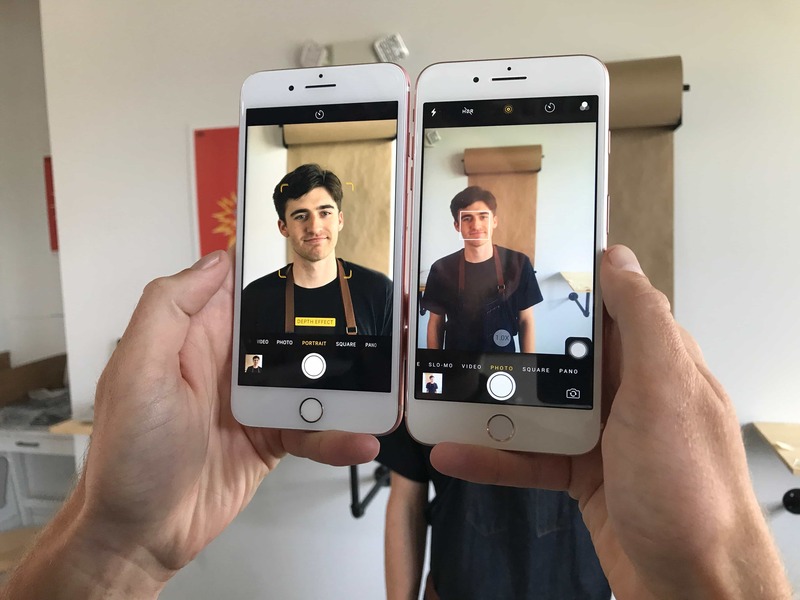 While the phone we have is clearly a fake, it’s still impressive that the company developed its own working phone and fit it into a frame nearly identical to a real iPhone. 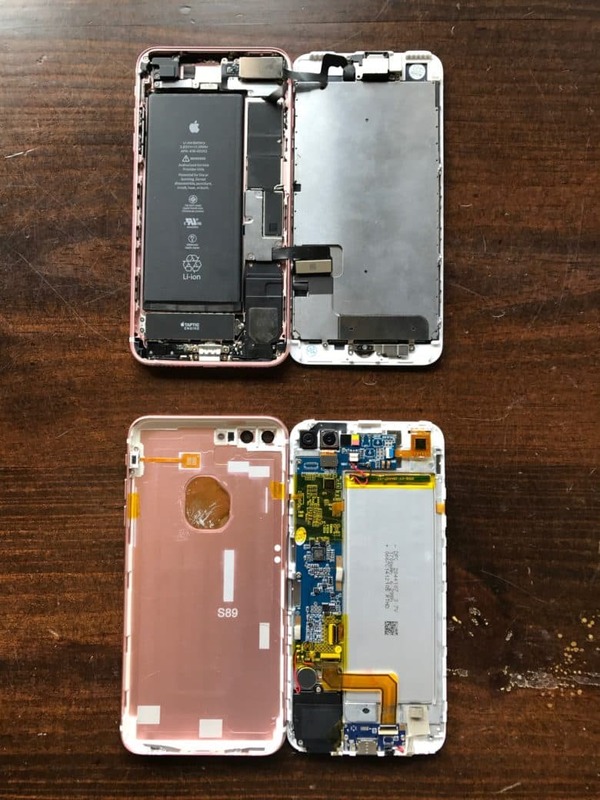 The main physical differences between this impressive fake iPhone and the real deal are the lower-quality camera and unreliable Home button. Internally, the biggest drawback is the operating system. But again, this iPhone clone still works. 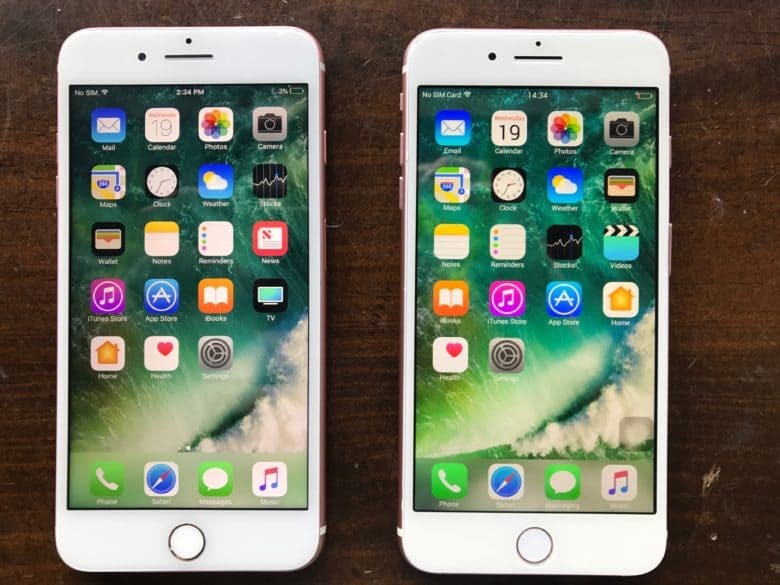 To see the differences between the iPhone clone and the real deal, you need to crack open the devices. Clearly the fake iPhone is on the bottom. We hesitate to say this is some sort of wide-scale scam, but somebody sent this phone to us with the very clear intention of fooling us into buying it. When we contacted the would-be seller, he told us he’d been fooled into buying the fake iPhone. After he realized he’d been taken, he figured he’d try to recoup some of his money by unloading the device to us. Please don’t do that. Don’t waste our time trying to scam us out of hundreds of dollars with a fake iPhone. We know when they’re fake. However, if you want to swap a real iPhone or other Apple product (or even an Android device), you can get a quick quote today from our buyback program. 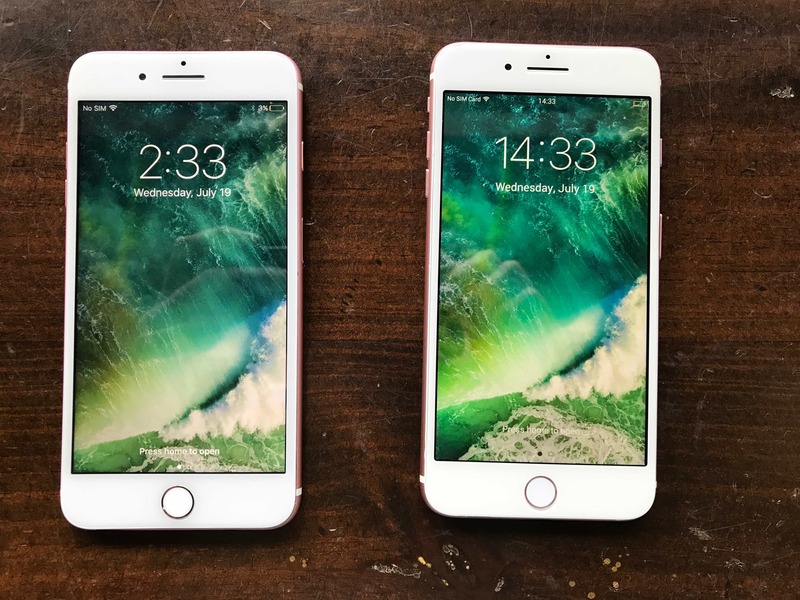 Here’s how you can sell your iPhone quickly and easily. Just go to the Cult of Mac buyback page. Then select the type of device you want to sell and follow the prompts. When you’re happy with your quote, click “Get Paid!” Then we’ll send you a box for your device with a return label. Simply place the box and your device in the mail and we’ll send you a check in return. It’s the quickest and easiest way to make some cash, so get a quote today. Just don’t try selling us a fake iPhone 8.